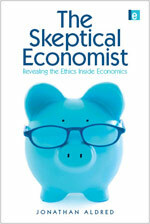 The Economics Anti-Textbook: "The Skeptical Economist"
You can have a peek via google books. This, and Moshe Adler's Economics for the Rest of Us (mentioned here recently), and others, made me think that we were catching a wave, that something about the times was prompting these critiques of the way mainstream economics is presented. I am of the same opinion. I think that issues such as climate change and peak oil, as well as the financial crisis in particular, have been forcing a serious re-think of our economic models of late by the mainstream, however, that is not to say there is not a very healthy history of critical thinking in this area on which to base many of the books and papers being published. The analysis of global poverty and the economic models which in many ways perpetuate it is just one area where new insights on political economy have long been offered. My own experience of studying economics was that I had to read outside of the material I was being directed to by the teachers in order to understand a different narrative of the subject’s underpinnings and its fundamental flaws. Looking back though, I wish I had more of the books available now to help me more easily confront those teachers about the subject they were teaching. Students today should use these books to do just that and challenge a new approach to a subject which is undergoing a crisis in my opinion.